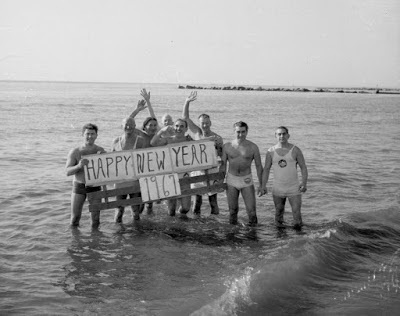 Hello and welcome to the New Year! I enjoyed a nice holiday from posting here at PCS. I hope you had some down time, too. I've plugged it a couple times already, but I hope you'll check out our new side blog: Pop '67! It's a look back at pop culture 50 years ago. It's predecessor, Pop '66!, was a lot of fun to create, though it never enjoyed PCS-level readership. And, speaking of 1966, our pal Booksteve mentioned that he's wrapped up his long-running 1966: My Favorite Year blog, too. Tune into his regular site for good stuff. I enjoyed lots of good reading over the holidays, including the most recent issue of Comic Book Creator, one of the great many mags published by the folks at TwoMorrows. 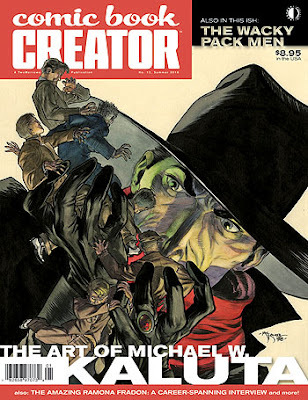 This one featured lengthy, well-illustrated, interviews by two awesome, but very different, artists of the 1960s and 70s: Ramona Fradon and Michael W. Kaluta. In my mind, these two exemplify the difference between a cartoonist versus an illustrator - not that one is any better than the other. Fradon is a cartoonist - somebody with a perhaps God-given knack for telling stories in pictures. Her comic book art obeys all the fundamentals of anatomy and perspective, yet isn't overly "realistic." There's a sense she's depicting an imaginary, cartoonish world - not our reality. Kaluta's work, on the other hand, hearkens back to the great book illustrators of yesteryear. Though his comic art conveys movement and action, it looks more like the real world. He's also a master of creating a singular image - such as a comics cover or poster - that tells a story in its own right. Kaluta admits in his interview that storytelling is something he had to learn, while Fradon says it's something that's always come naturally. We're very lucky to have them both. Who'd want to be without Fradon's Aquaman or Metamorpho, or Kaluta's Shadow or Starstruck? Combining these two profiles in a single magazine highlights the delightful diversity found among the great comics artists. Like the rest of the world, I also saw "Rogue One: A Star Wars Story" over the holidays. SPOILERS for anyone who didn't see it! I have to admit I was disappointed, and not simply because this is a darker story than the other Star Wars films. It boiled down to the story being unnecessary - I think we've gone back to the Death Star well enough times (before, during, after) - and the characters being a bore. 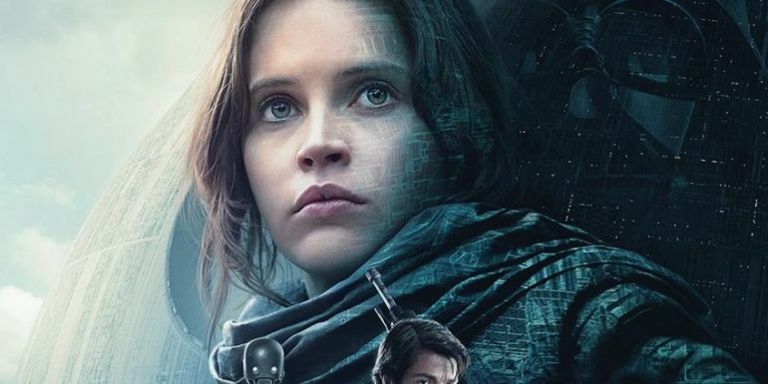 I wanted to like Felicity Jones as Jyn Erso. She has a compelling screen presence, but the character gave her nothing much to work with. The two males leads had little personality, either, and the snarky droid seemed trapped in the 1990s. Unlike "The Force Awakens," which introduced us to new characters who were fun and who I'm eager to see return to the screen, I'm left not really wanting to see any of these folks again. And - I put a SPOILER up there didn't I? - I guess I won't! Also over the holidays, I mourned the passing of Carrie Fisher and, the following day, her mother Debbie Reynolds. I don't have much to say that others haven't. 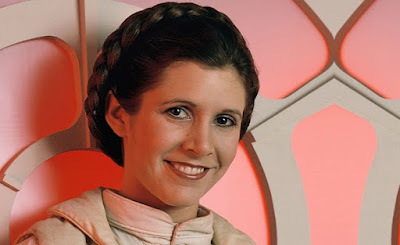 Like many, I grew up with Fisher as Princess Leia. I was there in the theater during the summer of '77 getting swept away like everyone else. And Reynolds will forever more light up the screen each time anyone watches "Singin' in the Rain." It will be fun to see the upcoming documentary on these two, prepared without a suspicion that we'd be losing them both before it's release. And I'm glad we haven't seen the last of Leia, as Fisher reportedly had completed filming all her scenes as the character for the next Star Wars film.